MyD88 is the main adaptor molecule for TLR and IL-1R family members. Here, we demonstrated that T-cell intrinsic MyD88 signaling is required for proliferation, protection from apoptosis and expression of activation/memory genes during infection with the intracellular parasite Trypanosoma cruzi, as evidenced by transcriptome and cytometry analyses in mixed bone-marrow (BM) chimeras. The lack of direct IL-18R signaling in T cells, but not of IL-1R, phenocopied the absence of the MyD88 pathway, indicating that IL-18R is a critical MyD88-upstream pathway involved in the establishment of the Th1 response against an in vivo infection, a presently controvert subject. Accordingly, Il18r1−/− mice display lower levels of Th1 cells and are highly susceptible to infection, but can be rescued from mortality by the adoptive transfer of WT CD4+ T cells. Our findings establish the T-cell intrinsic IL-18R/MyD88 pathway as a crucial element for induction of cognate Th1 responses against an important human pathogen. Myd88-deficient animals are highly susceptible to infection by multiple pathogens, including T. cruzi, and exhibit diminished Th1 differentiation, which has been attributed to defective IL-12 production by APCs, as a consequence of poor TLR signaling (Campos et al., 2004; Fremond et al., 2004; Scanga et al., 2002; Seki et al., 2002; Muraille et al., 2003). Few studies to date have directly addressed the relevance of T cell-intrinsic MyD88 signaling pathways for the establishment of in vivo cognate Th1 responses in the context of infection (Frazer et al., 2013; LaRosa et al., 2008; Raetz et al., 2013; Zhou et al., 2009). Although these studies reported that the absence of T-cell intrinsic MyD88 signaling severely impact the immune response, the Toll/IL-1R homologous region (TIR) domain-containing receptor upstream of MyD88 acting on CD4+ T cells was either not investigated or not identified and, therefore, remains speculative. Thus, presently, no consensus exists about the relative contribution of different receptors upstream MyD88 necessary for sustaining a robust Th1 response and contributing to CD4+ T cell memory formation in a model of infection. Cytokines of the IL-1 family contribute for the reinforcement and/or stabilization of CD4+ T cell lineage commitment into each of the main Th phenotypes: Th17, Th1 and Th2 (Acosta-Rodriguez et al., 2007; Chung et al., 2009; Guo et al., 2009). While the essential contribution of direct IL-1R signaling for the differentiation of Th17 cells has been documented in the EAE mouse model (Chung et al., 2009), the direct effect of IL-1 or IL-33 on the expansion of Th1 cells remains a more controversial issue (Ben-Sasson et al., 2009; Schenten et al., 2014; Villarreal and Weiner, 2014). IL-18 was initially shown to synergize with IL-12 for IFN-γ production by Th1 cells in vitro (Robinson et al., 1997), but its essential role in promoting Th1 responses to infection was not always confirmed in the context of in vivo infection (Haring and Harty, 2009; Monteforte et al., 2000). Moreover, although in other circumstances Il18−/− mice show a diminished Th1 response (Takeda et al., 1998), this phenotype cannot be uniquely ascribed to the lack of response of T cells to IL-18, as IL-18 also potentiates the secretion of IFN-γ by other cells, like NK cells (Takeda et al., 1998), which could in turn impact on Th1 response. In fact, NK-derived IFN-γ has a profound influence on Th1 responses (Scharton and Scott, 1993). Therefore, the full significance of T-cell intrinsic IL-1R and IL-18R signaling for Th1 responses to infection in vivo is still an important issue that needs further clarification. To investigate the role of T-cell intrinsic MyD88 signaling on Th1 differentiation in vivo, here we have infected mixed bone marrow (BM) chimeric mice with the intracellular protozoan T. cruzi, the etiologic agent of Chagas’ disease (American trypanosomiasis), a neglected emerging disease, which is endemic in Latin America. Several TLRs are involved in the protection against T. cruzi and Myd88−/− mice are highly susceptible to infection, displaying low levels of IFN-γ+CD4+ T cells (Bafica et al., 2006; Caetano et al., 2011; Campos et al., 2004; Oliveira et al., 2004, 2010; Rodrigues et al., 2012). Although the absence of TLR signaling in APCs of Myd88−/− mice may lead to their deficient activation and may explain a limited Th1 polarization response, these former results do not exclude the possibility that the absence of CD4+ T cell-intrinsic MyD88 signaling through IL-1R family members could also be an important factor for the deficient levels of Th1 cells in Myd88−/− mice. Here, we tested this hypothesis by comparing WT and Myd88-, Il1r1- or Il18r1-deficient T cells in infected mixed BM chimeras. Besides comparing T cell numbers, BrdU incorporation and the expression of IFN-γ, CCR5 and CD44 by flow cytometry, we also analyzed the transcriptional profile of WT and Myd88-deficient CD4+ T cells, sorted from infected mixed BM chimeric mice. Our results revealed, for the first time, the critical role of T cell-intrinsic IL-18R/MyD88 signaling for mounting a robust Th1 cognate response, as a consequence of proliferation, protection from apoptosis and expression of activation/memory genes during infection with an intracellular pathogen. Furthermore, we demonstrated the high susceptibility of Il18r1−/− mice to infection with T. cruzi, which could be rescued by the adoptive transfer of WT CD4+ T cells. In summary, the present study unambiguously demonstrates the crucial role of T cell-intrinsic IL-18R/MyD88 signaling for a robust Th1 cognate response against an important human pathogen and discloses the mechanistic framework underlying it. We first generated BM chimeras in which WT mice were irradiated and reconstituted with either WT or Myd88−/− BM cells. Infected Myd88−/−→WT mice die earlier than WT→WT chimeras, displaying mortality kinetics similar to non-chimeric Myd88−/− and WT mice, respectively (Figure 1A and B). This result shows that chimeric mice lacking MyD88 expression exclusively in cells of hematopoietic origin present a higher level of susceptibility to infection, similar to Myd88−/− mice. Next, we generated mixed BM chimeras. 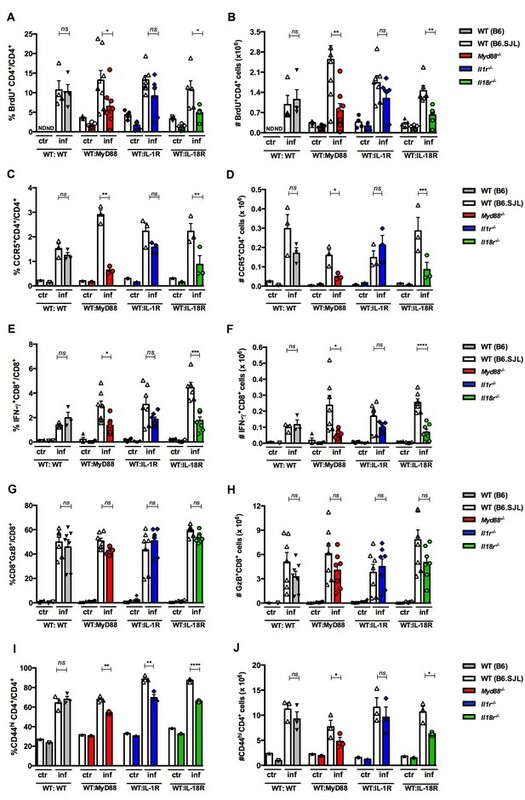 For this, irradiated WT B6 x B6.SJL F1 (CD45.1+CD45.2+) mice were reconstituted with a 1:1 mix of WT (CD45.1+) and Myd88−/− (CD45.2+) BM cells (Figure 1—figure supplement 1A). 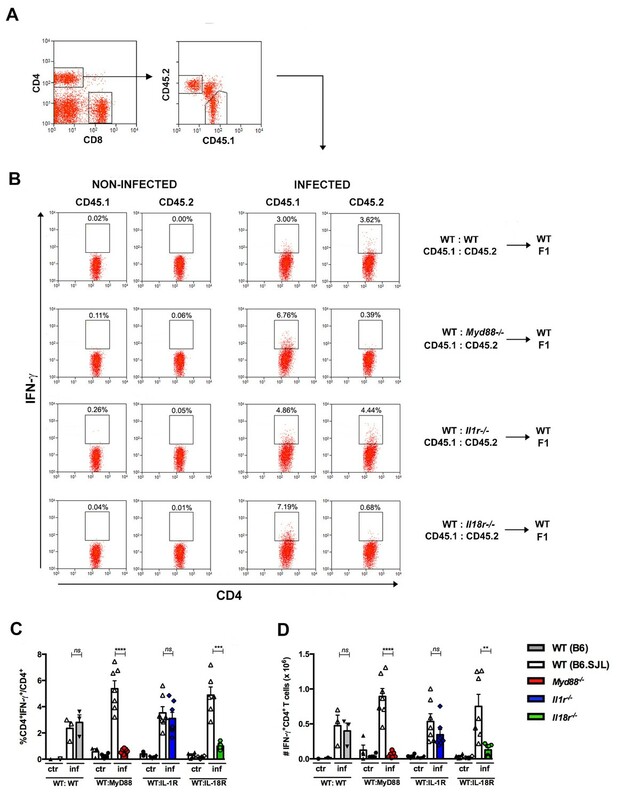 Six to 8 weeks after reconstitution, non-infected mixed chimeric mice show equivalent frequencies of WT and Myd88−/−CD8+ and CD4+ T cells (Figure 1C–E). Including residual WT recipient cells (CD45.1+CD45.2+), the mixed BM chimeras have more than 50% of WT DC in their spleen (Figure 1—figure supplement 1B) able to be fully activated by TLR pathways during infection with T. cruzi. At day 14 pi, we observed a preferential expansion of WT CD4+ T cells at the expense of Myd88−/−CD4+ T cells and, to a lower extent, of WT CD8+ T cells, at the expense of Myd88−/−CD8+ T cells (Figure 1C–E). This scenario was even more dramatic when the frequencies of IFN-γ+ cells among WT and Myd88−/−CD4+ T cells were analyzed. In order to determine the frequency of Ag-specific IFN-γ-producing CD8+T cells, total splenocytes from infected mixed BM chimeras were cultured in the presence of the Kb-restricted TSKB20 peptide, an immunodominant CD8 epitope (Oliveira et al., 2010). Infected APCs, present in the spleen of infected mice, are able to induce Ag-specific stimulation of CD4+ T cells in vitro, without the need of adding extra T. cruzi-derived Ag into the cultures (Oliveira et al., 2010). As shown in Figure 1F and G, the frequency of IFN-γ+CD4+ T cells of Myd88−/− origin was severely diminished compared to the frequency of WT IFN-γ+CD4+ T cells. The levels of Myd88−/−IFN-γ+CD8+ T cells were also diminished compared to WT IFN-γ+CD8+ T cells, but to a lower extent (Figure 1F and H). In mixed BM chimeras, similar to what was found in WT B6 mice (Oliveira et al., 2010), CD4+IFN-γ+ T cells are first detected around day 10 pi, their numbers attain a maximum around day 14 pi and then begin to decline (Figure 1—figure supplement 1C). Therefore, kinetic differences cannot explain the observed disparity in the percentages of IFN-γ+ cells between WT and Myd88−/− CD4+ T cells. Lower expansion of IFN-γ+CD4+ Myd88-/- cells in infected mixed BM chimeras. (A, B) Survival curves of mice infected ip with 2 × 103 blood trypomastigotes of the Y strain. (A) Myd88−/− (CD45.2+)→WT (B6 x B6.SJL F1, CD45.1+CD45.2+) and WT (B6.SJL, CD45.1+)→WT (B6 x B6.SJL F1, CD45.1+CD45.2+) chimeric mice 8 weeks after reconstitution and (B) WT (B6) and Myd88−/− mice. Survival curves are statistically different (p<0.05). All surviving mice in (A) were euthanized on day 25 pi (n = 6 to 9 per group). (C) Representative dot plots showing frequencies of CD45.1+ (WT) and CD45.2+ (Myd88−/−) among gated CD4+ or CD8+ spleen T cells from control non-infected or infected mixed BM chimeras. (D, E) Mean frequencies of data shown in (C). (F) Representative dot plots showing frequencies of IFN-γ+CD45.1+ and IFN-γ+CD45.2+ among gated CD4+ or CD8+ T cells. (G, H) Mean frequencies of data shown in (F). Mice (n = 4 per group) from control or infected mixed BM chimeric mice were Individually analyzed on day 14 pi. Error bars = SEM, *p≤0.05; **p≤0.01 (two-tailed Student t test). Data are representative of 4 independent experiments. Experimental design, frequency of CD45.1+ (B6.SJL, WT) and CD45.2+ (Myd88−/−) gated on CD11chigh spleen cells, as well as the kinetics of IFN-γ+CD4+ T cell response are shown in Figure 1—figure supplement 1. We next confirmed the lower expansion of Myd88−/−IFN-γ+CD4+ T lymphocytes in non-irradiated Rag2−/− recipient mice reconstituted with a 1:1 mix of WT and Myd88−/− splenocytes. In Rag2−/− recipient mice, 100% of host APCs express MyD88 and, again, we found that percentages and absolute numbers of CD4+IFN-γ+ T cells were much lower among Myd88−/−, than among WT cells (Figure 2). The same was true for IFN-γ-producing CD8+ T cells (Figure 2—figure supplement 1). 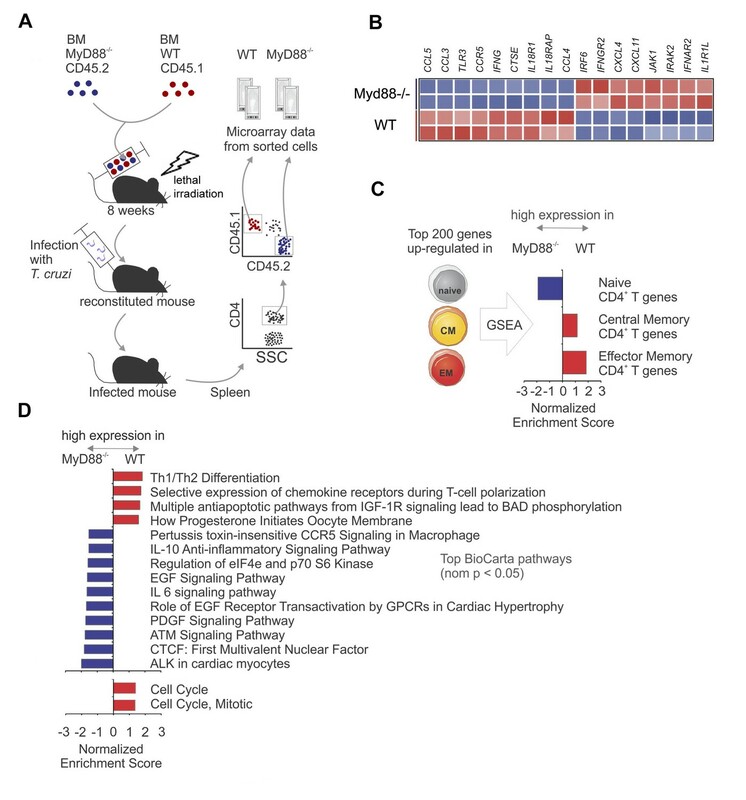 Together, these results clearly demonstrate that T cell-intrinsic MyD88 signaling is required for the expansion of Th1 cells, even when the totality of APCs in recipient mice expresses MyD88 and, therefore, are fully competent to provide co-stimulatory signals and cytokines. Lower expansion of IFN-γ+CD4+ Myd88 T cells in infected Rag2−/− mice reconstituted with WT and Myd88−/− splenocytes. (A) Gate strategy and dot plot analysis of IFN-γ+CD4+ T cells among CD4+CD45.2+ (Myd88−/−) or among CD4+CD45.1+ (B6) plus CD4+CD45.2+CD45.1+(B6xB6.SJL F1) (WT) T cells in Rag2−/− mice, reconstituted as described in Material and Methods section. (B) Mean frequencies and absolute cell numbers of Myd88−/− (rose) and WT (red) total CD4+ or IFN-γ+CD4+ T cells gated on CD4+ T cells from reconstituted naïve or infected Rag2−/− mice, individually analyzed on day 14 pi (n = 3 to 4). Error bars = SEM, *p≤0.05; **p≤0.01; ****p≤0.000 (two-tailed Student t-test). Data are representative of 2 independent experiments. Results obtained for the CD8+ T cell subpopulation are shown in Figure 2—figure supplement 1. We then compared gene expression between WT and Myd88−/−CD4+ T cells sorted from the spleen of infected mixed BM chimeras (Figure 3A). Several Th1 related genes as Ifng, Ccr5, Ccl5, Ccl4 and Ccl3 were upregulated in WT CD4+ T cells compared to Myd88−/−CD4+ T cells (Figure 3B). Table 1 (Figure 3—source data 1) lists genes upregulated and downregulated in CD4+ T cells from Myd88−/− vs WT (B6) origin. Gene expression differences between WT and Myd88−/− CD4+ T cells were then used in Gene Set Enrichment Analysis (GSEA) pre-ranking analysis (Figure 3C and D). Interestingly, sets of genes related to central and effector memory CD4+ T cells (CM and EM, respectively) (Abbas et al., 2009) were upregulated in WT cells, while genes expressed in naïve cells were relatively upregulated in Myd88−/−CD4+ T cells (Figure 3C). Moreover, sets of genes related to anti-apoptotic pathways, as well as to cell cycle and mitosis were upregulated in WT CD4+ T cells (Figure 3D), in accordance with the higher expansion of WT cells observed in mixed BM chimeras (Figure 1) and with previous studies reporting that Myd88−/− T cells have increased propensity for apoptosis (Frazer et al., 2013; Tomita et al., 2008). Interactions among the genes were assessed and visualized by Ingenuity Pathway Analysis (IPA) database, indicating a network of naïve CD4+ T cell genes, which are highly expressed in Myd88−/−CD4+ T cells (Figure 3—figure supplement 1A) and a network of EM genes highly expressed in WT CD4+ T cells (Figure 3—figure supplement 1B). Therefore, the analyses of RNA microarray data are in conformity with our cytometry results and indicate that CD4+ T cell-intrinsic MyD88 signaling is necessary for sustaining a more robust Th1 differentiation program, proliferation and resistance to apoptosis, resulting in selective expansion of WT IFN-γ+CD4+ T cells in response to infection with T. cruzi. Gene expression profiles of WT and Myd88−/− CD4+T cells sorted from mixed BM chimeras infected with T. cruzi. (A) Experimental design: CD4+CD45.1+ cells (WT) and CD4+CD45.2+ cells (Myd88−/−) were sorted (99% of purity) from the pool of splenocytes obtained from infected mixed BM chimeric mice at day 14 pi (n = 4). Two individually sorted samples of each cell population (WT or Myd88−/−) were assayed independently for gene expression profile. (B) Heat map of normalized expression of Th1 signature genes in sorted WT or Myd88−/− CD4+ T cells: upregulated in red, downregulated in blue. (C) Gene Set Enrichment Analysis (GSEA) applied to genes highly expressed in WT or Myd88−/− CD4+ T cells using gene signatures of naïve and memory CD4+ T cells. Gene sets from naïve, central memory (CM), effector memory (EM) CD4+ T cells were generated using the top 200 differentially expressed genes in each subset (see Methods). Gene sets enriched in WT cells (red bars) or in Myd88−/− cells (blue bars) are displayed. (D) GSEA using Selected BioCarta (top) and Reactome (bottom) pathways (nominal p-value<0.05) enriched in WT cells (red bars) or in Myd88−/− cells (blue bars) are displayed. GSEA was performed using the pre-ranked genes and parameters as described in (C). Colors represent higher expression in WT (red) or Myd88−/− (blue). Gene networks with genes in core from GSEA analysis are shown in Figure 3—figure supplement 1. Since MyD88 is an essential adaptor molecule not only downstream of most TLRs, but also of IL-1 and IL-18 pathways, we investigated whether the lack of IL-1R or IL-18R would by itself reproduce the effects observed in Myd88−/− T cells. First, we performed a kinetic study of the presence of IL-1β and IL-18 in the serum of infected B6 mice. As shown in Figure 4—figure supplement 1A, a higher level of IL-1β was detected on day 13 pi, although an early peak of this cytokine was also detected at 12 hr after infection. On the other hand, we could only detect IL-18 at a later time point of infection, at day 13 pi (Figure 4—figure supplement 1B). Note that peaks of IL-1β and IL-18 at day 13 pi were paralleled by increased percentages of Th1 cells in the spleen of infected mice (Figure 4—figure supplement 1C). We then analyzed the expression of IL-1R1 and IL-18R1 receptors on splenic T cells from infected B6 mice (at day 14 pi) and from non-infected controls. As shown in Figure 4A, at this time point of infection, around 50% of CD44hiCD4+ T cells express the master gene of Th1 cells, T-bet, and the majority of T-bet+CD44hiCD4+ T cells expresses IL-18R1 but not IL-1R1 (Figure 4B). In fact, no upregulation of IL-1R1 was observed on CD44hiCD4+ T splenocytes from infected mice (Figure 4B) and a higher percentage of T-bet+CD44hiCD4+ T cells expresses IL-1R1 in non-infected controls than in infected mice (Figure 4C). To further dissect this issue, we stained splenic T cells from infected B6 mice with anti-CD44 and anti-CD62L. As shown in Figure 4D, IL-18R1 is expressed mainly on CD44hiCD62L- (effector and EM) CD4+ T cells of infected mice, while IL-1R1 is mainly expressed on CD44hiCD62L+ (CM) CD4+ T cells. Note that no difference on the percentage of IL-1R1+ cells among CM CD4+ T cells was found between infected and non-infected control mice. These results indicated IL-18R, but not IL-1R, signaling as an important event in the generation of the Th1 cell response to infection. IL-18R, but not IL-1R, is upregulated in CD4+T cells upon activation following infection. (A) Gate strategy and mean percentage of CD44hiCD4+ and T-bet+CD44hiCD4+ cells gated on CD4+ T splenocytes from non-infected controls and infected B6 mice at day 14 pi. (B) Representative dot plot of IL-1R, IL-18R and T-bet expression, gated on CD44hiCD4+ T cells as in (A). (C) Representative histograms and mean percentages of IL-1R and IL-18R expression, gated on T-bet+CD44hiCD4+ T cells, as shown in (A) and (B). (D) Representative dot plot of CD44 and CD62L expression, gated on CD4+ T cells and mean percentages of IL-1R and IL-18R expression on CD44loCD62L+, CD44hiCD62L- and CD44hiCD62L+ gated on CD4+ T cells (n = 3 to 4). Error bars = SEM, *p≤0.05; **p≤0.01; ****p≤0.0001; ns = non significant (two-tailed Student t-test). Data are representative of 3 independent experiments. Kinetics of IL-1β and IL-18 levels in the serum, as well as of the appearance of IFN-γ+CD4+ T cells in the spleen are shown in Figure 4—figure supplement 1. To further test the hypothesis that the impaired expansion of IFN-γ-producing cells among Myd88−/−CD4+ T cells is due to the lack of IL-18R signaling, we generated mixed BM chimeras by the irradiation of WT B6 x B6.SJL F1 mice followed by reconstitution with a 1:1 mix of WT B6.SJL and Il1r1−/−, or Il18r1−/−, or Myd88−/− BM cells; control WT:WT→WT chimeras, which were reconstituted with a mix of B6.SJL and B6 BM were also generated. 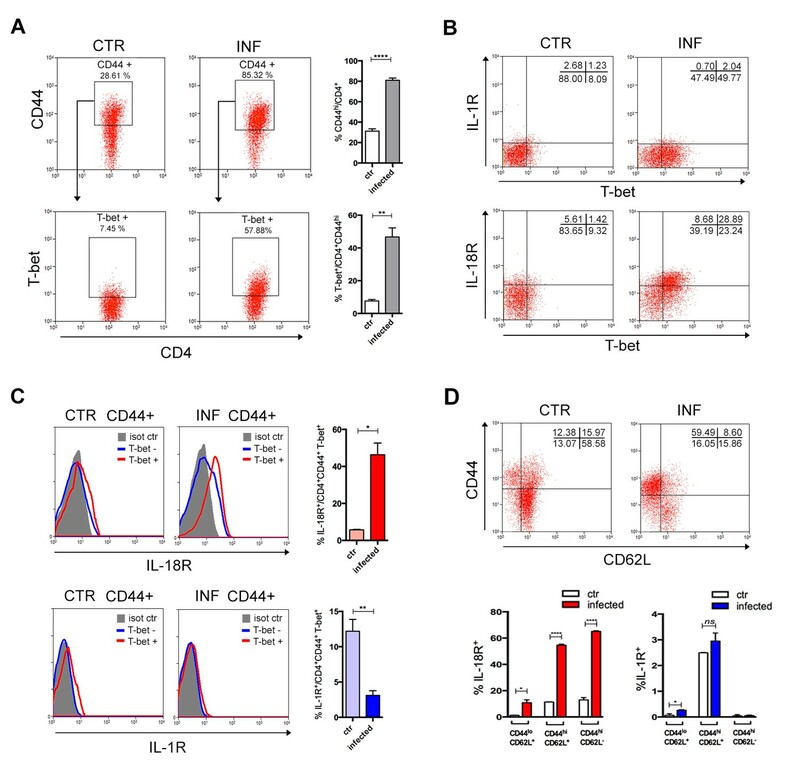 As shown in Figure 5, the percentage and the absolute numbers of IFN-γ+ cells among Il18r1−/−CD4+ T lymphocytes in mixed WT:Il18r1−/− chimeras and among Myd88−/−CD4+ T lymphocytes in mixed WT:Myd88−/− chimeric mice were significantly lower than the levels observed for WT CD4+ T cells in both sets of chimeras; the same was not true for Il1r1−/− IFN-γ+CD4+T cells, which were present at similar percentages and absolute numbers to WT IFN-γ+CD4+ T cells in WT:Il1r1−/− chimeric mice. We then analyzed BrdU incorporation in vivo by CD4+ T cells in the same groups of infected chimeras. As shown in Figure 6A and B, again, results obtained in WT:Il18r1−/−, but not in WT:Il1r1−/− chimeras, reflected the results obtained in WT:Myd88−/− chimeric mice (gate strategy on Figure 6—figure supplement 1). The same results were obtained when we analyzed the percentage and absolute numbers of cells expressing the Th1-associated chemokine receptor CCR5 among WT, Myd88−/−, Il1r1−/− or Il18r1−/− CD4+ T lymphocytes (Figure 6C and D, gate strategy on Figure 6—figure supplement 2), confirming the results obtained in microarray analyzes of WT and Myd88−/− CD4+ T cells (Figure 3). 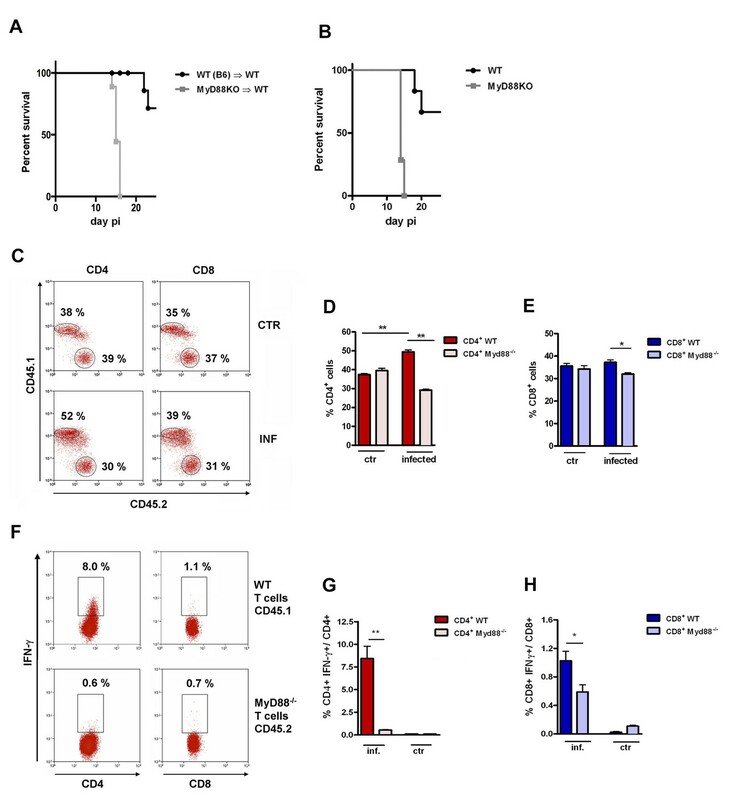 Effects of the absence of T cell-intrinsic MyD88, IL-1R or IL-18R signaling on IFN-γ production by spleen CD4+ T cells of infected mixed BM chimeras. (A) Representative dot plots showing gating strategy for CD4+ T cells and for CD45.1+ (B6.SJL WT) or CD45.2+ (B6 WT or Myd88−/− or Il1r1−/− or Il18r1−/−) splenocytes from mixed BM chimeras. (B) Representative dot plots of IFN-γ expression gated on CD4+CD45.1+ (B6.SJL WT) or CD4+CD45.2+ (B6 WT or Myd88−/− or Il1r1−/− or Il18r1−/−) splenocytes from non-infected control or infected (2 × 103 blood trypomastigotes, ip) mixed BM chimeras, on day 14 pi. (C) Percentages and (D) absolute cell numbers of IFN-γ+CD4+ T cells gated as in (A) and (B). Bars are the mean of combined data from 2 independent experiments (n = 3 to 7 individually analyzed chimeric mice); error bars = SEM; ns = non significant; **p≤0.01; ***p≤0.001, ****p≤0.0001 (two-tailed Student t-test). Data are representative of 3 to 4 independent experiments. Effects of the absence of T cell-intrinsic MyD88, IL-1R or IL-18R signaling on the proliferation and phenotype of CD4+ and CD8+spleen T cells from infected mixed BM chimeras. (A, C, G, E and I) Mean frequencies and (B, D, F, H and J) absolute cell numbers of: (A and B) BrdU+CD4+ and (C and D) CCR5+CD4+ cells gated on WT CD45.1+ or KO CD45.2+ CD4+ T cells, as in Figure 5A. (E and F) IFN-γ+CD8+ and (G and H) GzB+CD8+ T cells gated on WT CD45.1+ or KO CD45.2+ CD8+ T cells, as shown in Figure 6—figure supplement 3. (I and J) CD44hiCD4+ T cells, gated on WT or KO CD4+ T cells as in Figure 5A. Bars are the mean of individually analyzed mice from one (C, D, I and J) or two combined independent experiments (A, B, E, F, G and H). (n = 3 to 8); error bars = SEM; ND = not done; ns = non significant; *p≤0.05; **p≤0.01; ***p≤0.001, ****p≤0.0001 (two-tailed Student t-test). Gate strategies and representative dot plots are shown in Figure 6—figure supplements 1–5. 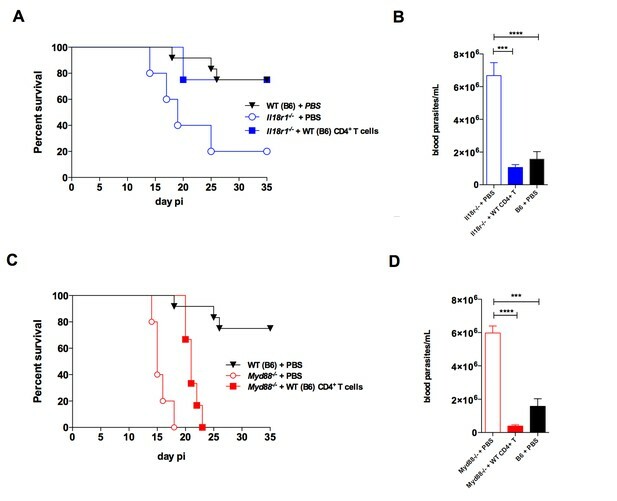 On the other hand, the lack of MyD88 or IL-18R signaling has a lower impact in impairing the expansion of IFN-γ+CD8+ T cells (Figure 1E and H and Figure 6E and F, gate strategy on Figure 6—figure supplement 3), compared to its effect on the CD4+subset (Figure 1D and G and Figure 5). Moreover, when the levels of granzyme B+ (GzB+) CD8+ T cells were compared between the WT and KO compartments in the chimeric mice, no difference in the percentage nor in the absolute numbers of CD8+CTLs was found between WT and KO cells in any of the different mixed BM chimeras (Figure 6G and H, gate strategy on Figure 6—figure supplement 4), in accordance with our previous study showing that the cytotoxic response mediated by CD8+ T cells is not affected in Myd88−/− mice (Oliveira et al., 2010). We then analyzed the expression of the activation/memory marker CD44 on CD4+ T cells and found that the lack of expression of MyD88, or IL-1R, or IL-18R reduced the percentages and numbers of CD44hiCD4+ T cells (Figure 6I and J, gate strategy on Figure 6—figure supplement 5). The lower percentages of CD44high among KO-derived CD4+ T cell are in agreement with the our GSEA analysis of microarray data, which indicates the upregulation of genes related to central and effector memory phenotypes in WT but not in Myd88−/−CD4+ T cells (Figure 3C). Together, these results show that CD4+ T lymphocyte-intrinsic IL-18R/MyD88 signaling is required for the full differentiation and/or expansion of Th1 cells. To verify the impact of the absence of IL-18R- or MyD88-mediated signaling on resistance to infection, we compared parasitemia levels, as well as survival and parasite load in the myocardium, between Il18r1−/−, Myd88−/− and WT (B6) mice (Figure 7A–C). As shown in Figure 7A, WT mice presented significantly lower parasitemia when compared to either Il18r1−/− or Myd88−/− mice at day 9 pi, when the peak of parasites in the blood is attained, and no statistical difference in parasitemia levels was found between Il18r1−/− and Myd88−/− mice. On the other hand, Myd88−/− mice are the most susceptible to infection, as all mice of this strain were dead by day 15 pi, while the totality of Il18r1−/− mice were dead only by day 23 pi, a time point at which only 32.5% of WT mice have succumbed (Figure 7B). Parasite loads were measured in the myocardium by qPCR at day 14 pi and a significantly higher load was found in Myd88−/−compared to Il18r1−/− mice, which in turn also display a higher parasite load in the heart when compared to WT mice (Figure 7C). This result is in accordance with the earlier mortality observed in Myd88−/− mice and might reflect the importance of innate signaling through TLRs in the tissue for parasite control (Rodrigues et al., 2012). We then analyzed parameters of the acquired response in the three strains of mice. Notably, both Il18r1−/− and Myd88−/− mice presented lower percentages and absolute numbers of IFN-γ+CD4+ T cells in the spleen, when compared to WT mice (Figure 7D and G), but the percentages of IFN-γ+CD8+ and GzB+CD8+ T cells were found to be equivalent in the three mouse strains (Figure 7E,F,H and I). In summary, Il18r1−/− mice presented an intermediary level of susceptibility to infection with T. cruzi, in terms of survival and parasite load in the myocardium, when compared to Myd88−/− and WT (B6) mice. Il18r1−/− mice are highly susceptible to infection with T. cruzi and display lower frequency and absolute numbers of Th1 cells. (A) Parasitemia curve, (B) survival and (C) parasite load in the myocardium at day 14 pi of Il18r1−/−, Myd88−/− and WT B6 mice infected with 2 × 103 blood trypomastigotes of the Y strain. Survival curves are statistically different (p<0.05). (D–I) Mean frequencies and absolute numbers of (D, G) IFN-γ+CD4+(E, H) IFN-γ+CD8+ and (F, I) GzB+CD8+ cells, gated on CD4+ or CD8+ T splenocytes from 4 to 8 individually analyzed mice at day 14 pi. Data are representative of 3 independent experiments. Error bars = SEM; ns = non significant; *p≤0.05; **p≤0.01; ****p≤0.0001 (two-tailed Student t-test). Given that both Il18r1−/− and Myd88−/− infected mice displayed lower levels of Th1 cells in the spleen, when compared to WT animals, we asked whether the adoptive transfer of WT CD4+ T lymphocytes to Il18r1−/− and Myd88−/− strains would be enough for lowering parasitemia levels and improve survival to infection, in accord with the crucial role of Th1 responses for protection against T. cruzi infection (Michailowsky et al., 2001). For this, CD4+ T cells were sorted from infected WT mice to high purity levels (Figure 8—figure supplement 1A) and were then transferred to both Il18r1−/− and Myd88−/− mice, 20 hr before infection. As shown in Figure 8, this was in fact the case: WT CD4+ T cells significantly improved control of parasite levels (Figure 8B and D) and survival (Figure 8A and C) in both strains. Moreover, the ability to lower parasitemia required the capacity of secreting IFN-γ by transferred CD4+ T cells, since the adoptive transfer of Ifng−/− CD4+ T cells to Myd88−/− mice had no effect (Figure 8—figure supplement 1B). However, while the mortality rate in Il18r1−/− mice that received WT CD4+ T cells attained the rate observed in WT B6 mice (Figure 8A), the adoptive transfer of WT CD4+ T cells into Myd88−/− mice ameliorated survival only partially (Figure 8C). The same result was obtained when transferring 4 × 106 purified WT CD4+ T cells, that is, 3 times more cells than in the experiment shown in Figure 8 (data not shown). 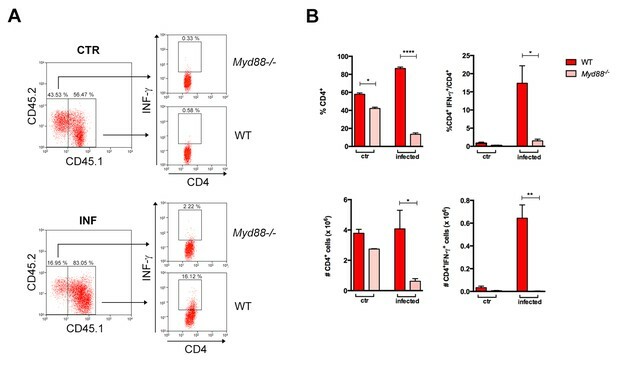 Note, however, that the transfer of WT CD4+ T cells reduced parasitemia to numbers observed in WT mice, both in Il18r1−/− and in Myd88−/− mice, as shown in Figure 8B and D. Together, these results show that while increasing the numbers of IFN-γ+CD4+ T cells in Il18r1−/− mice is enough for restoring their resistance to infection to the WT level, both in terms of parasitemia and survival, this is not the case for Myd88−/− mice. Although in transferred Myd88−/− mice parasitemia was decreased to the WT level (as in transferred Il18r1−/−mice) and survival was also significantly delayed, still, the totality of Myd88−/− mice succumbed to infection. The adoptive transfer of purified WT CD4+ T cells protects Il18r1−/− and Myd88−/− mice against infection with T. cruzi. (A and C) Survival; (B and D) mean parasitemia levels at day 9 pi of Il18r1−/− (A and B) or Myd88−/− mice (C and D), which received or not 1.3 × 106 CD4+ T cells purified from infected WT B6 mice. Results obtained in infected but non-transferred WT B6 mice are shown in black lines and black bars. Data are representative of 2 independent experiments, using 8 to 10 male mice in each group; error bars = SEM. Survival curves of transferred and non-transferred mice are statistically different (p<0.05). 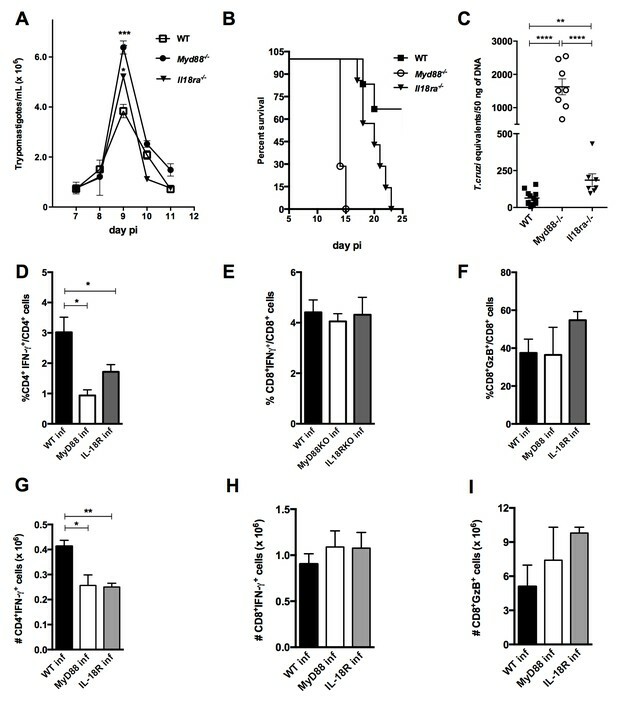 Purity of adoptive transferred CD4+ T cells and parasitemia in Myd88−/− mice adoptively transferred with WT or Ifng−/− CD4+ T cells are shown in Figure 8—figure supplement 1. Here, we have shown that T cell-intrinsic IL-18R/MyD88 signaling is crucial for the development of a robust Th1 response induced by infection with the intracellular pathogen, T. cruzi. Although previous studies, in different models of infection, have shown the importance of MyD88 signaling intrinsic to T cells, none of those works has identified the receptor upstream the MyD88 adaptor molecule playing a determinant role for the Th1 response in vivo (Frazer et al., 2013; LaRosa et al., 2008; Raetz et al., 2013; Zhou et al., 2009). IL-18 has been reported as a relevant factor in protective immunity against several intracellular pathogens and its functions in vivo are multiple, being produced by and acting on different cell types (Nakanishi et al., 2001; Garlanda et al., 2013). The role of IL-18 in Th1 differentiation has been however neglected, maybe because it has been shown dispensable for Th1 development under certain circumstances, as for example when IL-12 is present in high levels, (Haring and Harty, 2009; Monteforte et al., 2000). IL-18 synergizes with IL-12 in promoting IFN-γ secretion and Th1 differentiation, but it is not capable of promoting Th1 polarization per se and it is thus considered a reinforcing or stabilizing factor for Th1 commitment (Robinson et al., 1997) and reviewed in Berenson et al., 2004). Early in the process of Th1 differentiation, IFN-γ is required to induce nuclear factors as T-bet and IRF1 and it is necessary for the expression of the IL-12 receptor β1 subunit (IL-12Rβ1) (Kano et al., 2008). Then, IL-12 signaling drives the up-regulation of IL-18Rα expression, which can next be maximized by IL-18 itself (Smeltz et al., 2002; Berenson et al., 2004). GSEA analysis of our microarray data revealed that sets of genes involved in proliferation and protection from apoptosis were upregulated in WT in comparison to their expression in Myd88−/−CD4+ T cells. These results are in accordance with the preferential expansion of WT Th1 cells in vivo, measured by flow cytometry and in vivo BrdU incorporation. Also, flow cytometry analyses of characteristic Th1 genes showed that percentages and absolute numbers of cells expressing IFN-γ and CCR5 among Myd88−/− and Il18r1−/−CD4+ T lymphocytes were found similarly lower when compared to WT cells in BM mixed chimeric mice. Therefore, together, these results indicate that the lack of intrinsic IL-18R signaling in CD4+ T cells phenocopied the absence of MyD88 signaling, resulting in lower Th1 cell numbers in vivo. It is worth noting that the majority of our analyses were performed at the peak of detection of the Th1 response in our system, day 14 pi, when the parasite is still present in the host (Oliveira et al., 2010). In this aspect, our present study differs from a recent report where the importance of IL-18R/MyD88 signaling for a noncognate Th1 response was put in evidence at later time points of infection with Salmonella, by the injection of LPS, (O'Donnell et al., 2014), apparently in a TCR-independent way, as previously proposed (Robinson et al., 1997; Berenson et al., 2004). The hypothesis that other MyD88-dependent T-cell intrinsic signaling, as TLR-pathways, might also be relevant for the Th1 response in the present system is, in our opinion, unlikely. We and others have previously shown that Tlr4−/− as well as Tlr2−/− mice infected with T. cruzi display normal levels of CD4+IFNγ+ T cells (Bafica et al., 2006; Oliveira et al., 2010). The possibility that TLR7 or TLR9, would play an intrinsic role in T cells would most likely require the phagocytosis of the parasite by T cells, in order to allow parasite-derived RNA and DNA to reach endosomal TLRs, a non-reported fact in T cells. The hypothesis that other MyD88-mediated signaling pathways, as IFN-γ-induced IRF1<styled-content style="background-color: #ffffff;"> (Negishi et al., 2006)</styled-content>, might be also contributing for Th1 response was not formally disproven here. However, we believe that our data, showing an insufficient expansion of IL-18R-defective Th1 cells, of the same magnitude as observed for MyD88-defective Th1 lymphocytes, even in an environment where WT APCs are abundant, argue in favor of a model where the lack of a strong Th1 response observed in Myd88−/− mice is mostly due to the absence of IL-18R signaling in CD4+ T cells. A recent report also detected the importance of T-cell intrinsic MyD88 signaling for the induction of functionally competent Th1 and memory CD4+ T cells, using Myd88FL/FLCd4-cre mice immunized with antigen plus adjuvant (Schenten et al., 2014). This is in agreement with our GSEA analysis, showing that sets of genes related to central and effector memory were up-regulated in WT, but not in Myd88−/−CD4+ T cells. In the cited study, however, the responsible pathway upstream MyD88 was attributed to IL-1R, which was shown to render naive CD4+ T cells refractory to Treg cell-mediated suppression. Although we have not studied the memory response in the infection model here, we also found a significant lower percentage of cells expressing high levels of the CD44 activation/memory marker among CD4+ T cells lacking IL-1R expression, as well as among Myd88−/− and Il18r1−/−CD4+ T cells. Concerning the Th1 response, however, we could not detect any defect in IL-1R-deficient cells. Moreover, we found that contrary to IL-18R, IL-1R is not expressed on CD4+ T cells in response to infection with T. cruzi. This apparent discrepancy between the cited study and ours may be due to differences in the inflammatory response and cytokine milieu between an infection model and the Ag plus adjuvant system employed by Schenten and collaborators (Schenten et al., 2014). It is possible that diverse, higher and/or more prolonged cytokine levels are attained in the infection with T. cruzi compared to Ag plus adjuvant immunization. Possibly, during infection, another cytokine, such as IL-6, might be replacing the missing IL-1R signaling in T conventional cells to overcome Treg-mediated suppression, as previously described (Nish et al., 2014). It is also worthwhile to note that employing the system of mixed BM chimeras allowed us to compare WT and gene-deficient T cells competing with each other and being submitted to the same inflammatory milieu. Mixed BM chimera strategy also circumvents compensatory mechanisms observed in some knockout mouse strains. We have also studied here the susceptibility of Il18r1−/− mice to infection with T. cruzi. This strain exhibited parasitemia as high as Myd88−/− mice and survival and parasite load in the myocardium at intermediary levels, between Myd88−/− and WT mice. Both Il18r1−/− and Myd88−/− mice have diminished levels of Th1 cells, but CD8+ T responses were not affected, as predicted by our previous work showing intact in vivo Ag-specific cytotoxicity in Myd88−/− mice (Oliveira et al., 2010). Although Il18−/− mice were shown to be resistant to T. cruzi (Graefe et al., 2003), discrepancy between the outcomes in Il18r1−/− versus Il18−/− mice was also previously documented for infection with M. tuberculosis and in autoimmunity (Gutcher et al., 2006; Schneider et al., 2010). The reason for this fact is not clear so far, but a reported compensatory mechanism increasing IL-12 production in Il18−/− mice may explain the observed higher resistance of this strain (Monteforte et al., 2000). Nevertheless, we clearly demonstrated here that Il18r1−/− mice display low levels of IFN-γ+CD4+ T cells in response to infection with T. cruzi and are highly susceptible to infection. These results are consistent with our findings demonstrating the essential role of T cell-intrinsic IL-18R/MyD88 signaling for cognate Th1 response to this parasite. 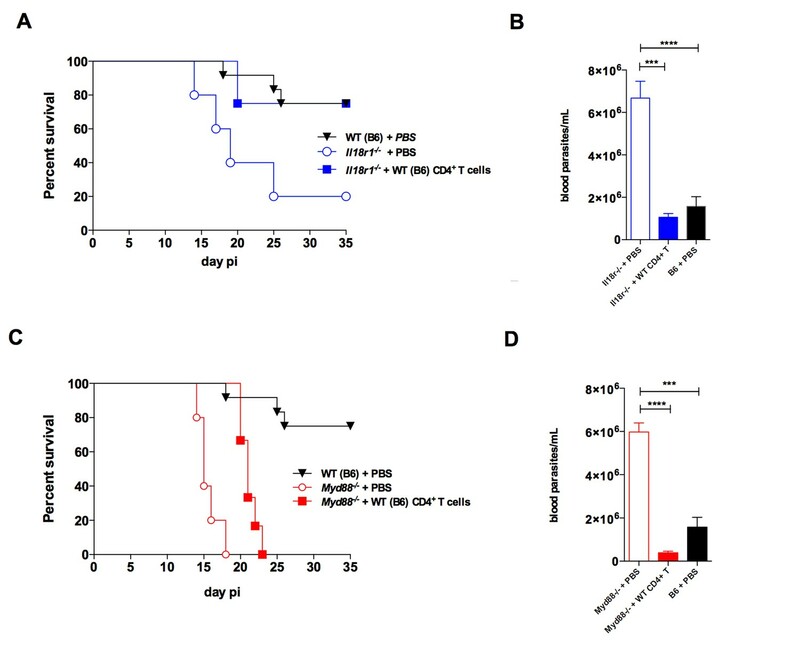 Furthermore, the adoptive transfer of WT CD4+ T cells was able to reduce parasitemia to WT levels in both Il18r1−/− and Myd88−/− infected mice, in an IFN-γ-dependent way, and to improve survival in both strain. However, mortality was brought to WT rate only in the adoptively transferred Il18r1−/− strain. These results are in accordance with the fact that mortality due to infection with T. cruzi is not always a simple and direct correlation to parasitemia. Instead, in some cases, mortality is due to increased pro-inflammatory cytokine release (Hölscher et al., 2000). It is tempting to speculate that other MyD88-independent innate mechanisms, as the TLR4/TRIF pathway, might be responsible for this putative pro-inflammatory effect in Myd88−/− mice. Alternatively, but not mutually exclusive, tissue-tolerance mechanisms, possibly involving MyD88-dependent feedback control responses, might protect the host from immune- or pathogen-inflicted damage and would be impaired in Myd88−/− mice. This hypothesis is presently being investigated in our laboratory. In conclusion, our work unequivocally demonstrates that the absence of IL-18R exclusively in T cells during infection leads to a deficient cognate Th1 response. By excluding other cell types, as NK cells and the IL-1R receptor-signaling pathway in this process, our work brings a conceptual advance to the field. Adding to the established paradigm of TLR/MyD88-dependent activation of APCs for IL-12 production and the resulting initiation of Th1 response, our data demonstrated the critical role of T cell-intrinsic IL-18R/MyD88 signaling for the reinforcement of Th1 response in vivo, placing MyD88-dependent signaling pathways on the control of multiple phases of Th1 response: co-stimulation, differentiation, expansion and memory establishment. Altogether, the results presented here disclose and extend a mechanistic framework for understanding CD4+ T cell responses, whose optimization may provide new therapeutic and vaccination strategies to combat intracellular pathogens. C57BL/6, B6.SJL and (B6 x B6.SJL) F1 mice were obtained from the Universidade Federal Fluminense (UFF, Niterói, Brazil). Myd88−/− mice were generated by Dr. S. Akira (Osaka University, Japan) and backcrossed onto C57BL/6 genetic background for 9 generations; Rag2−/− and Il18r1−/− mice were donated by Dr. R. Gazzinelli (UFMG, MG, Brazil) and Dr. B. Ryffel (CNRS, Orleans, France), respectively. Il1r1−/− mice were purchased from JAX Mice, USA. Experiments were conducted in accordance with guidelines of the Animal Care and Use Committee of the Federal University of Rio de Janeiro (Comitê de Ética do Centro de Ciências da Saúde CEUA-CCS/UFRJ). Procedures and animal protocols were approved by CEUA-CCS/UFRJ license n.: IMPPG022. Five to six week-old C57BL/6, Myd88−/− or Il18r1−/− male mice, or BM mixed chimeric mice after 6–8 week of reconstitution were inoculated intraperitoneally (ip) with 2 × 103 trypomastigotes/0.2 ml bloodstream trypomastigotes of the Y strain of T. cruzi. Parasitemia was monitored by counting the number of bloodstream trypomastigotes in 5 μl of fresh blood collected from the tail vein and mouse survival was followed daily. Hearts of infected mice were excised after perfusion, minced and the cardiac tissue immediately homogenized in 1.0 ml of 4.0 M Guanidine thiocyanate (SIGMA-Aldrich) containing 8.0 μl/ml of β-mercaptoethanol (SIGMA-Aldrich) and processed for DNA extraction. Generation of PCR standards and detection of parasite tissue load by real-time PCR was carried out as described (Cummings and Tarleton, 2003); briefly, primers amplify a repeated satellite sequence of T. cruzi DNA of 195 base-pairs: TCZ-Fwd. : (5'-GCTCTTGCCCACAAGGGTGC-3') and TCZ-Rev. : (5'-CCAAGCAGCGGATAGTTCAGG-3'). Reactions with TNF-α-Fwd: (5’- CCTGGAGGAGAAGAGGAAAGAGA-3’) and TNF-α-Rev. : (5’- TTGAGGACCTCTGTGTATTTGTCAA-3’) primers for Mus musculus TNF-α gene were used as loading controls. PCR amplifications were analyzed using primers in combination with SYBR Green on a StepOne Real Time PCR System (Applied Biosystems, Life Technologies). For BM chimeras, acidic drinking water (pH 2,5–3,0) was given for 8 days to B6 x B6.SJL F1 (CD45.2+ CD45.1+) recipient mice prior to irradiation with a lethal single dose of 800 rad (TH780C - Theratronics, Canada).The day after irradiation, BM cells were transferred and mice were treated with neomycin sulfate (2 mg/mL) in the drinking water for 15 days. Marrow was harvested from the femur and tibia of B6.SJL (CD45.1+) and B6, Myd88−/−, Il1r1−/−or Il18r1−/− (CD45.2+) mice by flushing with cold RPMI media (GIBCO). BM cells were washed thoroughly with PBS and 4 × 106 total cells were injected into the irradiated recipient mice. For mixed chimeras, CD45.1+ and CD45.2+ BM cells were transferred in a 1:1 ratio (2 × 106 cells each). Alternatively, non-irradiated mixed chimeric Rag2−/− mice were generated by the iv injection of 20 × 106 spleen cells from WT B6.SJL (CD45.1+) and Myd88−/− (CD45.2+) mice in a 1:1 ratio. Six to eight weeks after the first reconstitution, Rag2−/− mice received a second injection of WT B6 x B6.SJL F1 (CD45.1+CD45.2+) and Myd88−/− (CD45.2+) splenocytes in a 1:1 ratio, 6 hr before being infected. In all experiments, mice were infected 6 to 8 weeks after cell transfer, when reconstitution was achieved. On different days post infection, mice were euthanized and spleens were harvested. Spleen cells were treated with ACK buffer for red blood cell lysis, washed and then stained. Single cell suspensions from spleen were incubated with anti-CD16/CD32 (FcR block) for 5 min and then stained with anti-CD45.1, anti-CD45.2, anti-CD11c, anti-CD3, anti-CD4, anti-CD8, anti-CCR5, anti-TCRβ, anti-T-bet, anti-IL-1R1, anti-IL-18R1, anti-CD62L or anti-CD44 antibodies (see table below) for surface staining for 30 min on ice. Alternatively, 2 × 106 spleen cells were cultured in the presence of monensin (5 μM) and 2 μM of Kb-restricted Tskb20 peptide (Genscript) for 10 hr. After staining of surface markers, cells were fixed with paraformaldehyde 1% for 1 hr and permeabilized with saponin 0.2% for 20 min. At least 20,000 events gated on CD4+ T lymphocytes were acquired. Analytical flow cytometry was conducted with a MoFlo (Beckman Coulter/Dako-Cytomation) or FACSCalibur (BD Bioscience) and the data were analyzed with Summit V4.3 software (Dako Colorado, Inc). Mixed chimeric mice were infected with T. cruzi and BrdU (1.0 mg/animal) was administered ip at days 12 and 13pi every 12 hr. At day 14 pi, mice were sacrificed and 2 × 106 spleen cells were surface stained with anti-CD45.1, anti-CD45.2, anti-CD3, anti-CD4 and anti-CD8 (see table below). For BrdU analysis, after surface staining, cells were fixed and permeabilized with 2% paraformaldehyde, 0.02% Tween 20 in PBS overnight at 4°C. Then, cells were washed with PBS and incubated in DNase buffer (150 mM NaCl, 5 mM MgCl2, 10 μM HCl, 100KU/mL DNase I) for 1 hr at RT. Subsequently, cells were washed with PBS, 2% FCS, 0.05% sodium azide and stained with FITC-conjugated anti-BrdU for 30 min at RT. Blood samples were collected at different days of infection and the sera were stored at - 80°C. Samples from individual mice were diluted 10x for IL-1β quantification or non-diluted, for IL-18 detection. Cytokine levels were determined using mouse IL-18/IL-1F4 ELISA kit and mouse IL-1beta/IL-1F2 DuoSet ELISA kit (R and D Systems) according to the manufacturer's instructions. Eight week-old male C57BL/6 mice were infected with 104 trypomastigotes and at day 9 pi spleen cells were harvested and treated with ACK for red blood cells lysis. For CD4+ T cell enrichment by negative selection, 3 × 108 spleen cells were labeled with anti-B220, anti-CD11b, anti-NK1.1, anti-γδ and anti-CD8 biotinylated antibodies (see table below) for 30 min on ice and incubated with Dynabeads® Biotin Binder (Invitrogen, Life Technology) for 30 min on ice under agitation and depleted, according to manufacturer’s instructions. The CD4+-enriched cells were stained with PE-conjugated anti-CD4, and PE-Cy7-conjugated Streptavidin. For sorting, PE-Cy7+ cells were excluded and CD4+ T lymphocytes were sorted using MoFlo (Beckman Coulter/Dako-Cytomation) flow cytometer. CD4+ T cells presenting purity higher than 98% were adoptively transferred by iv injection into Myd88−/−or Il18r1−/− recipient mice (1.3 × 106 cells/animal) followed by infection with 2 × 103 trypomastigotes, 20 hr later. Parasitemia and survival were accompanied daily. Mixed BM chimeric WT(B6.SJL):Myd88−/−→ WT (B6 x B6.SJL F1) mice were euthanized at day 14 pi, spleen cells were collected and the enrichment of CD4+ cells was done as described above. Cells were stained with PB-anti-CD45.1, APC-Cy7-anti-CD45.2 and PE-anti-CD4 antibodies (see table below) and the sorting was conducted with a MoFlo (Beckman Coulter/Dako-Cytomation) flow cytometer. CD4+CD45.1+ cells (WT) and CD4+CD45.2+ cells (Myd88−/−) were sorted (99% of purity) and RNA was prepared from sorted cell populations by Trizol (Invitrogen) extraction followed by RNeasy extraction (Qiagen), according to manufacturer’s protocols. For microarray analysis, RNA was labeled and hybridized to Illumina MouseRef-8 v2.0 Expression BeadChips array according to the Illumina protocols by the Rockefeller University Genomic facility. Gene expression data were extracted with GeneSpring software GX 11.0 software using default parameters. Data was then normalized by subtracting the average from all genes from each gene intensity and dividing the result by the standard deviation of all gene intensities (i.e. z-score normalization) Z ratios were calculated as previously described (Cheadle et al., 2003) and used to compare the difference in expression between WT samples and Myd88−/− samples. Gene Set Enrichment Analysis (GSEA) (http://www.broadinstitute.org/gsea/index.jsp) was performed on the genes pre-ranked by Z ratios (1000 permutations and Weighted Enrichment Statistic) and using 3 different gene sets: BioCarta pathways (c2), Reactome pathways (c2) and GSE11057. GSE11057 gene set is comprised of genes highly expressed in 3 subsets of CD4+ T cells: Central memory (CM), Effector memory (EM) and Naïve. To identify these genes, we re-analyzed the microarray data set from reference (Abbas et al., 2009), using the GEO2R tool (http://www.ncbi.nlm.nih.gov/geo/geo2r/) (Adj p-value<0.01; top 200 genes based on log2 fold-change on CM vs naïve and EM vs naïve comparisons). Interactions among the ‘genes in core’ from the GSEA analyses were assessed and visualized by Ingenuity Pathway Analysis (IPA) database. Statistical analyses were performed using GraphPad Prism version 5 for Windows (GraphPad Software, San Diego California USA, www.graphpad.com). Sample sizes were chosen to allow the detection of statistical differences with p<0.5 using a two-tailed Student’s t test or the Log-rank (Mantel-Cox) test, for mouse survival curves after challenge with T. cruzi. When comparing two groups, the minimum number was n = 3 per group. In some experiments, the number was increased to n = 9 to permit p<0.5 even considering the possibility of a single outlier in a population. Data are expressed as mean ±SEM and considered statistically significant if p values were < 0.05. Original microarray data have been assigned NCBI Gene Expression Omnibus database (GEO) accession no. GSE57738. The Journal of Immunology 177:3515–3519. The Journal of Immunology 187:1903–1911. The Journal of Immunology 172:1711–1718. The Journal of Molecular Diagnostics 5:73–81. Molecular and Biochemical Parasitology 129:53–59. The Journal of Immunology 191:4269–4279. Journal of Clinical Investigation 114:1790–1799. The American Journal of Pathology 159:1723–1733. The Journal of Immunology 164:5890–5893. The Journal of Immunology 170:4237–4241. Annual review of immunology 19:423–474. The Journal of Immunology 173:5688–5696. Journal of Parasitology Research 2012:507874. The Journal of Immunology 168:5997–6001. Journal of Experimental Medicine 178:567–577. European Journal of Immunology 40:396–405. The Journal of Immunology 169:3863–3868. The Journal of Immunology 168:6165–6172. The Journal of Immunology 180:5291–5299. Current Opinion in Immunology 28:102–106. Thank you for submitting your work entitled "T cell-intrinsic MyD88 signaling in cognate immune response to intracellular parasite infection: crucial role for IL-18R" for consideration by eLife. Your article has been reviewed by three peer reviewers, one of whom is a member of our Board of Reviewing Editors and the evaluation has been overseen by a Senior Editor. The reviewers have opted to remain anonymous. Our decision has been reached after consultation between the reviewers. Based on these discussions and the individual reviews below, we regret to inform you that your work will not be considered further for publication in eLife at this time. The area of research surrounding the need for MyD88 signaling in mediating protective immunity against infections is quite extensive. You, however, have embarked on a study of a somewhat contradictory aspect of MyD88 signaling by investigating the contribution of cytokine receptors, namely IL-1R and IL-18R, which together with MyD88 may be necessary to maintain Th1 responses to prevent infections. Thus, the observation that signaling by MyD88 and IL-18R in CD4 T cells from mice infected with T. cruzi might potentially by novel. However, on the basis of strength of the evidence that you present here, the conclusions in regard to the predominant role of IL-18R signaling in T cells following T. cruzi infection are not fully supported. Although your experimental approaches utilizing various bone marrow mixed chimeras combined with the various knockout mice are quite impressive, the experiments also lack robustness. Unedited reviews from all three reviewers are included. Because of the potential novelty of your findings, it is strongly suggested that you perform all the suggested key experiments and respond to all other comments in a manner that would be acceptable by eLife and you are welcome to consider submitting your manuscript as a new submission to eLife. There is a substantial body of evidence suggesting the need for MyD88 signaling to mediate protective responses against infections. These authors are guided by several contradictory observations concerning the contribution of cytokine receptors, namely IL-1R and IL-18R, which together with MyD88 may be necessary to maintain Th1 responses necessary to prevent infections. They have embarked on a set of rather ambitious experiments, utilizing bone marrow mixed chimeras and MyD88-/-, IL1R-/- and IL18R-/- mice to test the hypothesis that the absence of MyD88 signaling involving IL-1R family in CD4 T cells might be important factor contributing to deficient Th1 cells in MyD88-/- mice. According to the evidence that they present, it is IL-18R/MyD88 signaling in CD4 T cells that is needed for a proper Th1 (IFN-γ) response, activation of memory genes, and protection from apoptosis in Trypanosoma cruzi infected mice. The observation that signaling by MyD88 and IL-18R in CD4 T cells from mice infected with T. cruzi might indeed by novel. However, I find this rather ambitious and extensive study to be lacking rigorous experimental approach. The Rag2-/- results are quite important in support of their hypothesis, yet they are relegated to the supplemental section. Moreover, gating strategies need to be shown for the cells isolated from the Rag-/- recipients. Apart from expressing the results as% , the authors need to include cell numbers. This is true for all other results where the authors have chosen to express cellular responses as percentages. This is simply insufficient. In relation to the cell numbers, what proportion of CD4 T cells are specific for T. cruzi following infection? Is it possible just to sort all of the CD45.1 and then CD4+ T cells and assume that all of them are Tc specific? Another serious concern is the number of mice used per experiment or the number of times a given experiment was performed. In general I find it difficult to trust statistics performed on responses from 3 or 4 mice. Also, what do the authors mean that a given experiment was performed either 3 or 4 times? What are the percentages of CD45.2 vs. CD45.1 in the plot 1. Figure 3A? It also appears that results shown in Figure 4A, plot A are the same as Figure 3A. Is that true? The authors state in subsection “Lack of T cell-intrinsic IL-18R or MyD88 signaling leads to lower frequencies of Th1 cells but does not affect CD8+ CTLs” these results were from a different set of chimeras. Is it possible that a transfer of a higher numbers of sorted CD4 T cells (Figure 6) would have been more effective in MyD88-/- recipients? In addition, the writing itself is missing many details that detracts from my general enthusiasm about this body of work. I found the paper very difficult to read as I had to constantly move from the Results section to the Figure legends to find some necessary bit of information, which often was either contradictory or missing (Legends for Figure 1 and Figure 1—figure supplement 1). The results concerning CD11c DC appear (Figure 1—figure supplement 1B) out of nowhere and one is not clear if these data are derived from LN or spleens and at which time point after infection. The same is true for using the Kb-restricted TSKB20 peptide. I would think that a preface for including CCR5 in the analysis is missing hence one is not clear as to why it was even measured. a) It solves a controversial issue, ie. The role of MyD88, TLR and IL-1 in the induction of Th1 responses in T. cruzi infection. b) It advances our understanding of CD4+ T cell responses in pathogenic infections. 1) Why is IL18 crucial for expansion of T cells but not IFN-γ production on a per cell basis? The authors do not discuss this interesting observation. 2) How much IL18 and how much IL1 are produced during T. cruzi infection. Can the authors measure serum levels of IL18 and IL1 at different timepoints? 3) What are the major sources of IL18 in T. cruzi infection? Antigen presenting cells or stromal cells? 4) What are the stimuli that induce I18 production? Which stimuli induce IL18 during T. cruzi? 1) Staining for IL-18R and IL-1R on T cells from infected mice should be performed, potentially with an assessment of IL1-R family receptor expression on parasite antigen-specific T cells. 2) The authors suggest a crucial role for IL-18R, however, the presented data in Figure 4 of T cell phenotypes suggest an additional role for IL-1R on CD4+ T cells. 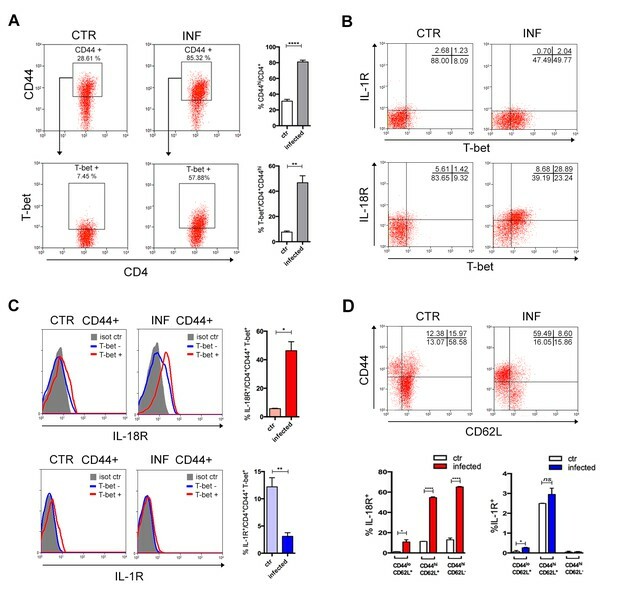 3) Although a statistically significant contribution of IL-1R to the frequency of CD44hi CD4+ and BrdU+ cells is seen (Figure 4), IFN-γ expression seems unaffected in the absence of IL-1R (Figure 3C). It is unclear why WT cells in the WT:IL1-R mixed BM chimeras in Figure 3C are not making as much IFN-γ as the WT cells within the other mixed chimeras (WT:Myd88; WT:IL-18R) – this may suggest a greater, unexplored role for non-T cells. These additional signals may be absent when half of the non-T cells also lack expression of MyD88 or IL-18R. 4) The in vivo survival data suggest that IL-18R does not account for all of the MyD88-dependent responses, reflecting previous studies that TLR signaling and other IL-1R family members may play a role in T cell expansion, survival, activation, and/or IFN-γ production. 5) Parasite clearance seem to be largely unaffected in the absence of IL-18R signaling, both by time course parasitemia (Figure 5A) and parasite load in the myocardium at day 14 p.i. (Figure 5C). These data would suggest that, following pathogen clearance, other MyD88-dependent mechanisms are accounting for the observed survival differences. It would be important to know if T cells are mediating these effects since the authors also suggest MyD88-dependent signaling in the tissue may be largely responsible for parasite control. […] The Rag2-/- results are quite important in support of their hypothesis, yet they are relegated to the supplemental section. Mixed bone-marrow chimeras have been classically employed in order to test the in vivorole of molecules intrinsic to cells of hematopoietic origin. In these studies, as in ours, a 1:1 mixture of wild type and knockout/mutant derived BM reconstitute irradiate recipients. Alternatively, when the cell type being investigated is a T lymphocyte, Rag-/-mice can be reconstituted with a mixture of total spleen, or purified mature T cells, derived from different donors, without the need of host irradiation. However, in this case, the B cell compartment is not fully reconstituted and antigen-presenting cells (APCs) of donor origin are minimally present (if at all) in the Rag-/- host. In our manuscript, the focus of study is the CD4+ T cell population in a model of infection with T. cruzi. Survival to infection with T. cruzi also depends on the presence of a B cell response (Cardillo et al., 2007). Consequently, due to the lack of B cells, the T-cell reconstituted Rag-/- mice are quite susceptible to the infection, even when reconstituted with 100% WT T cells, dying early after infection. Therefore, we concluded that, for this infection model, mixed-BM chimeric mice were more appropriate to test the role of T-cell intrinsic expression of the IL-1R/MyD88 and IL-18R/MyD88 signaling pathways for Th1 differentiation and expansion. Nevertheless, we did control experiments using 1:1 WT:MyD88-/- reconstituted Rag2-/- mice to rule out effects of body irradiation and to compare WT and MyD88-/- CD4+ T cells in a system where APCs are basically 100% WT, since the possibility (although remote) existed that T cell activation might be affected in irradiated BM-reconstituted hosts, in which part of the APCs lack expression of MyD88. As already shown in Figure 1—figure supplement 1 in the first version of the manuscript, the data obtained in reconstituted Rag2-/- mice confirmed the results obtained in the irradiated mixed BM chimeras. Since the results we’ve obtained in the two models were essentially the same, we originally thought it was better to show one representative experiment with reconstituted Rag2-/- mice in Figure 1—figure supplement 1. But following reviewer #1 request, we have moved these results to novel Figure 2, now including gating strategies and the percentage and absolute numbers of WT and MyD88-/- CD4+ T cells producing IFN-γ in Rag2-/- mice. We have also created Figure 2—figure supplement 1 to display gating strategies and the percentage and absolute numbers of WT and MyD88-/- CD8+ T cells producing IFN-γ in reconstituted Rag2-/- mice. Please note that, in order to increase the levels of B cells, Rag2-/- mice reconstituted 6 week earlier with a 1:1 mixture of WT and MyD88-/- splenocytes, received a second injection of 1:1 mixture of WT and MyD88-/- splenocytes 6 hrs before being infected, as now described in the Materials and methods section. Moreover, gating strategies need to be shown for the cells isolated from the Rag-/- recipients. Gating strategies for cells from the reconstituted Rag2-/- mice are now shown in Figure 2 and Figure 2— figure supplement 1. Apart from expressing the results as% , the authors need to include cell numbers. This is true for all other results where the authors have chosen to express cellular responses as percentages. This is simply insufficient. We agree with reviewer #1 that besides percentages, absolute number of cells may be relevant for the interpretation of the results. These data were now added to the revised version of the manuscript (see Figures 2, Figure 2—figure supplement 1, Figure 5, Figure 6—figure supplements 1 to 5 and Figure 7), as requested. In relation to the cell numbers, what proportion of CD4 T cells are specific for T. cruzi following infection? Is it possible just to sort all of the CD45.1 and then CD4+ T cells and assume that all of them are Tc specific? We have some difficulty in understanding which is exactly the point raised by the reviewer here, as we do not claim at any moment in the manuscript that the totality of sorted CD4+ T cells in experiment shown in Figure 2 (now Figure 3) is T. cruzi-specific. In the past, massive T cell responses to T. cruzi, as well as to other pathogens, such as certain viruses, were interpreted as mostly polyclonal and nonspecific. However, with the advent of MHC-tetramer technology and other pieces of evidence, it was shown that a higher percentage of CD8+ T cells activated during acute viral infection was in fact virus-specific, than had previously been estimated. In fact, up to 50% of CD8+ T cells responding during the peak of viral infection can be specific for a single epitope (Murali-Krishna et al., 1998). Immunodominant T. cruzi CD8 epitopes, as well as a large number of specific subdominant CD8 epitopes, have also been described. These studies have revealed that selected members of the trans-sialidase gene family were natural targets for T. cruzi infection-induced CD8+ T cells, which can represent >30% of the entire CD8 compartment at the peak of the response in mice (reviewed in Tarleton 2015). As trypanosomatids have an extensively larger genome than viruses, one may expect that a larger number of pathogen-derived epitopes is presented to T cells. However, to the present, the exact proportion or numbers of specific CD4+ T cells against T. cruzi have not been fully evaluated. Moreover, defined immunodominant I-Ab-restricted CD4 epitopes derived from the Y-strain have not been described yet. Nevertheless, different studies have demonstrated that a significant proportion of CD4+ T cells produces IFN-γ in response to parasite Ags in infected humans and mice and that these responses are not a generalized non-specific activation of cells during infection with T. cruzi (Martin & Tarleton 2005). In our present manuscript, as well as in previous works of our group and from others (Oliveira et al., 2010), 4 to 12% of the CD4+ T cells from the spleen of B6 infected mice secreted IFN-γ in an Ag-dependent way. Moreover, as shown in Figure 6, we found that the percentage of cells expressing high levels of the activation/memory marker CD44, among CD4+ T lymphocytes in infected chimeras at day 14 pi, varies from 55% (among MyD88-/- CD4+) to 85% (among WT CD4+). Absolute numbers of CD44high CD4+ T cells are now shown in Figure 6—figure supplement 5, also indicating a huge increase in the number of activated/memory cells. Moreover, Figure 4 now shows that, in infected mice, most CD44hiCD4+ T cells do not express CD62L, which is the phenotype of effector and effector memory (TEM) cells. On the other hand, around 10% of total CD4+ T cells display the CD44hiCD62L+ TCM (central memory) phenotype at day 14 pi. Previous works have also demonstrated that high numbers of CD4+ TEM cells are generated in response to T. cruzi (Martin & Tarleton 2005). Therefore, activated effector and both TEM and TCM memory CD4+ T cells are highly represented in our sorting experiment, mainly among WT cells, and the results obtained in the microarray essay of sorted CD4+ T cells simply reflect this fact. Data illustrated in Figures 3 and 4 (now Figures 5 and 6), were obtained with 3 non-infected chimeric controls and 3 infected chimeric mice from each of the 4 groups of mixed-BM chimeras (WT:WT, WT:MyD88-/-, WT:Il1r1-/- and WT:Il18r1-/-), which were simultaneously assayed, in a total of 24 mice in each experiment. Student´s t-test was used for comparing cytokine and markers expression between WT and KO T cells within each group of chimeric mice. The small sample size, n=3, only allows statistical detection at p<0,05 if the effect is large and exhibit low variance, thus supporting our interpretation of the results. Moreover, group size n=3 is routinely used when comparing cytokine intracellular staining in lymphocytes by cytometry (examples are: Yang et al., 2016; Brennan et al., 2016, Figure 5; Ho et al., Figure 4) and, thus, our study procedure does not differ from the one adopted in papers published in renowned journals. However, in order to convince reviewer #1 of the consistency of our data and further strengthen the statistics, we have now combined data from two independent experiments, and a total of 6 to 8 mice per group are shown in Figures 5, Figure 6 and Figure 6—figure supplements 1 to 5. (Only in WT:WT control chimeras, the group size is n=3). The meaning of a given experiment having been performed 3 to 4 times is the following: different parameters were tested repeatedly in independent experiments: for example, BrdU incorporation was performed in 3 independent experiments, while intracellular IFN-γ staining was performed in 4 independent experiments. In each independent experiment, new chimeric mice were obtained by irradiating WT recipients that were then divided into 4 groups, each one being reconstituted with one of the different 1:1 mixtures of WT and KO BM and were infected 6 to 8 weeks later. In some experiments, only WT:MyD88-/- chimeras were constructed. In each independent experiment, 3 controls and 3 to 4 infected mice of each set of chimeras had the expression of several markers analyzed by flow cytometry. Percentages of CD4+ CD45.2+ and of CD4+ CD45.1 in the plot 1 of Figure 3A (now Figure 5A) are 36.53% and 38.35%, respectively. Percentages were now added to the Figure plot. Yes, Figure 4—figure supplement 1: (now Figure 6—figure supplement 1), plot A are the same as Figure 3A (now Figure 5A), since the stainings analyzed on both Figures are from the very same experiment. In order to avoid redundancy, however, we have now deleted this dot plot form Figure 6—figure supplement 1 and we apologize for this. It seems there was a misunderstanding about text in subsection “Lack of T cell-intrinsic IL-18R or MyD88 signaling leads to lower frequencies of Th1 cells but does not affect CD8+ CTLs”: In fact, we stated that: “We then analyzed BrdU incorporation in vivo by CD4+ T cells in the different sets of infected chimeras”. In fact, we were referring to the 3 previous cited different groups of mixed BM chimeras: MyD88-/-:WT; Il1r1-/-:WT and Il18r1-/-:WT, which were already analyzed in the previous Figure 3 (now Figure 5) To make it clearer we have now changed it for: “in the same groups of mixed BM chimeras”. This is an interesting point. We have done this experiment, now injecting 4 x 106 purified WT CD4+ T cells, that is, 3 times more cells than in the experiment shown in Figure 6, with the same results, as shown in Author Response Image 1. Therefore, a significantly increased number of transferred CD4 T cells was not more effective in protecting MyD88-/- recipients against mortality induced by infection. This information was now added to the text of the revised manuscript, in subsection “Il18r1-/- mice are highly susceptible to infection with T. cruzi” as data not shown. In addition, the writing itself is missing many details that detracts from my general enthusiasm about this body of work. I found the paper very difficult to read as I had to constantly move from the Results section to the Figure legends to find some necessary bit of information, which often was either contradictory or missing (Legends for Figure 1 and Figure 1—figure supplement 1). The results concerning CD11c DC appear (Figure 1—figure supplement Figure 1B) out of nowhere and one is not clear if these data are derived from LN or spleens and at which time point after infection. We apologize if our text was not enough clear for reviewer #1 understanding and we have now made modifications to improve it. However, it seems reasonable to us that details about experiments should be displayed in the Figure legends and in the Materials and methods section. Otherwise, an over-detailed text would lack fluidity and result even more difficult to read. In the specific case concerning the dot plot showing the frequencies of CD45.1+ (WT) and CD45.2+ (MyD88-/-) CD11c+ cells (Figure 1—figure supplement 1B), we referred to it in the main text (subsection “MyD88-/- Th1 cells attain lower frequencies in infected mixed BM chimeras.”) as follows: “Including residual recipient cells (CD45.1+CD45.2+), the mixed BM chimeras have more than 50% of WT DC in their LNs and spleen (Figure 1—figure supplement 1B), which can be fully activated by TLR pathways during infection with T. cruzi.” Therefore, this result did not “appear out of nowhere”, but instead it is referred to in the main text and it constitutes an important control about the frequency of WT DCs in the mixed BM chimeras. Moreover, in the legend of Figure 1—figure supplement 1B, we state that “(B) Representative frequencies of CD45.1+ (B6.SJL, WT) and CD45.2+ (MyD88-/-) cells gated on CD11chi spleen cells of non-infected mixed BM chimeric mice.” Therefore, it seems to us that the only missing information is the specification that equal results obtained in LNs were not shown. We have now removed the mention to LNs and apologize for this little forgetfulness. In the present version of the manuscript, we have also added that residual recipient (CD45.1+CD45.2+) cells are of WT origin, although this was already said in the description of mixed BM chimeras, few lines above: “irradiated WT B6 x B6.SJL F1 (CD45.1+CD45.2+), mice were reconstituted […]” (subsection “MyD88-/- Th1 cells attain lower frequencies in infected mixed BM chimeras.”). The same is true for using the Kb-restricted TSKB20 peptide. It is well known that effector T cells need to be further stimulated in vitro in the presence of monensin or brefeldin for cytokine intracellular staining (ICS) to succeed. In the T. cruzi model, while the pathogen-derived Ags present in the infected total spleen culture are sufficient for stimulating IFN-γ production by CD4+ T cells, the addition of specific antigenic peptides to the cultures is needed for the detection of IFN-γ in CD8+ T cells by ICS. In fact, when purified CD4+ T cells from infected mice were stimulated in vitro with non-infected APC, in the absence of any T. cruzi antigen, no IFN-γ is detected, as previously shown (Bafica et al., 2006 Figure 3C). On the other hand, when total splenocytes from infected mice on day 14 pi are plated, infected macrophages and DCs are present in the cultures and are sufficient for the Ag-specific stimulation of CD4+ T cells. In a previous study, we have shown that adding T. cruzi amastigote protein extract to the cultures only marginally increases the release of IFN-γ by CD4+ T cells in total splenocyte cultures (Oliveira et al., 2010). As immunodominant CD4 epitopes of T. cruzi have not been reported, we have chosen to stimulate CD4+ T cells in cultures using infected total splenocytes. For CD8+ T cells, on the other hand, immunodominant epitopes are well characterized, therefore, we added the immunodominant TSKB20 peptide to the cultures in order to further increase the specific antigenic response of CD8+ T cells. To explain this, the following phrases were present in the first version of the manuscript (subsection “MyD88-/- Th1 cells attain lower frequencies in infected mixed BM chimeras.”): “In order to determine the frequency of Ag-specific IFN-γ-producing T cells in the different T cell subpopulations, total splenocytes from infected mixed BM chimeras were cultured in the presence of the Kb-restricted TSKB20 peptide, an immunodominant CD8 epitope (Oliveira et al., 2010). Infected APCs present in the spleen of infected mice are able to induce Ag-specific stimulation of CD4+ T cells in vitro without the need of adding extra T. cruzi-derived Ag in the in vitro cultures (Oliveira et al., 2010)”. We believe this is sufficiently clear, but we will be glad to further clarify this point whether the reviewer believes it is still necessary. I would think that a preface for including CCR5 in the analysis is missing hence one is not clear as to why it was even measured. It is known that although chemokine receptor expression and differentiated Th phenotype are not strictly coordinate, some receptors, such as CXCR3 and CCR5, show a striking preferential expression on Th1 cells (Zhu & Paul, 2008; Bonecchi et al., 1998). We first referred to CCR5 in subsection “WT and MyD88-/- CD4+ T cells of infected mixed BM chimeras display different gene-expression programs.”, when introducing RNA microarray results: “Several Th1 related genes as IFN-γ, Ccr5 Ccl5, Ccl4 and Ccl3 were upregulated in WT CD4+ T cells compared to MyD88-/- CD4+ T cells”. Therefore, we have next analyzed, by flow cytometry, the expression of CCR5, the receptor for RANTES, macrophage-inflammatory protein 1α (MIP-1α) and MIP-1β on CD4+ T cells from mixed BM chimeras. We confirmed that a higher percentage and absolute number of CD4+ T cells expresses CCR5+ among WT, than among MyD88-/- or IL18R-/- CD4+ T cells (Figure 6 and Figure 6—figure supplement 2) and referred to this result as: “Th1- associated chemokine receptor CCR5 among WT, MyD88-/-, Il1r1-/- or Il18r1-/- CD4+ T lymphocytes […]”(subsection “Lack of T cell-intrinsic IL-18R or MyD88 signaling leads to lower frequencies of Th1 cells but does not affect CD8+ CTLs”). This result is in accordance with our microarray data and, together with the other results of the manuscript, led us to the conclusion that a higher expansion of Th1 cells occurs among CD4+ T cells expressing the IL-18/Myd88 signaling pathway. A low number of Th1 cells might be able to differentiate, proliferate and survive despite the lack of IL-18R/MyD88 signaling, possibly due to alternative signaling pathways, as IL-27 and/or others. Apparently, however, these alternative signaling pathways would not be as efficient as IL-18R/MyD88 for the expansion/survival of Th1 cells, at least during infection with T. cruzi. Nevertheless, it appears that the few IL-18R/MyD88-deficient Th1 cells, which are able to differentiate and survive, are also able of producing as much IFN-γ (induced by another pathway) as WT Th1, on a per cell basis. Since we have not experimentally explored this question in more detail, we refrained to speculate more on this observation in the present manuscript and this result was removed from the present version of the manuscript. We performed a kinetic study of the presence of IL-1β and IL-18 in the sera of infected B6 mice. These data are now included in the manuscript in Figure 4—figure supplement 1. As shown, a higher level of IL-1β was detected on day 13 pi, although an early peak of this cytokine was also detected at 12 h after infection. On the other hand, we could only detect IL-18 at later time points of infection (day 13 pi). This result is in accordance with the kinetics of IL-18 detection in the supernatants of spleen cultures of infected C3H mouse strain, previously published (Antunez et al., 2001). Detection of IL-18 in the serum at 13 dpi was also paralleled by IL-18 mRNA detection in the spleen, previously reported by others (Muller et al., 2001). Peaks of IL-1β and IL-18 at day 13 pi were followed by increased percentages of Th1 cells in the spleen of infected mice (Figure 4—figure supplement 1). It is important to note, however, that the biology of IL-1-family cytokines is rather complex: soluble receptors, as well as IL-binding protein, such as IL-1R2 and IL-18BP, might be present in the sera and inhibit IL-1 and IL-18 function, respectively, as well as their detection (Arend et al., 1994; Nakanishi et al., 2001). Moreover, IL-1β signaling can be outcompeted by the IL-1Ra soluble molecule, which is an antagonist that binds IL-1R1 with an affinity higher than that of IL-1β but fails to recruit the signaling IL-1RAcP chain. This is an interesting question. IL-18 mRNA is expressed in a wide range of cells including Kupffer cells, macrophages, T cells, B cells, dendritic cells, osteoblasts, keratinocytes, astrocytes, and microglias (reviewed in Nakanishi et al., 2001). As T. cruzi is able to infect different organs as liver and brain, among others, it is possible that different cell types, at different locations, are producing IL-18 following infection. However, few studies have fully investigated this point at the present, to our knowledge. IL-18 transcripts were detected in total spleen cells from infected B6 mice, increasing until day 14 post-infection (Muller et al., 2001). Also, IL-18 was detected in the supernatants of splenocyte cultures from infected mice (Antunez & Cardoni, 2001). Moreover, it has been shown, by in situ hybridization, that the number of cells expressing IL-18 mRNA in the spleen increases during infection with T. cruzi and most of the positive cells were found in the white pulp, especially in the PALS (Meyer Zum Buschenfelde et al., 1997). Our preliminary data have shown that IL-18 could also be detected in the supernatant (SN) of myocardium cultures obtained from infected mice, although at lower levels than in SN of spleen cultures (data not shown). 4) What are the stimuli that induce I18 production? Which stimuli induce IL18 during T cruzii? IL-18 gene expression may be upregulated by direct stimulation with microbe products such as LPS, or by cytokines such as type I and type II IFNs (reviewed in Nakanishi et al., 2001). Moreover, pro‐IL‐18 needs processing by caspase 1 to turn into functional IL-18. Thus, IL-18 production also requires inflammasome activation, or an alternative processing pathway (reviewed in Garlanda et al., 2013). Both TLR signaling pathways and the NALP3 inflammasome activation have been shown during infection with T. cruzi (Rodrigues et al., 2012; Silva et al., 2013). Specifically, glycosylphosphatidylinositol anchors of mucin-like glycoproteins (GPI-mucins), expressed in the surface of the trypomastigote stage of the parasite, have been shown to activate the TLR2 signaling pathway and to induce IL-18 transcripts (Ferreira et al., 2002; Campos et al., 2001). Moreover, one may expect that other described T. cruzi-derived PAMPs (as GIPL or CpG) together with danger signals released by tissue damage caused by the parasite and/or the inflammatory response against it, would also contribute to IL-18 production during infection. Overall, this work seems to lack significant conceptual advance to be of interest to the broader readership of eLife. The results described in our manuscript bring important advances for understanding the role of T cell-intrinsic IL-18/MyD88 signaling on the development of a robust Th1 response to infection. IL-18 has been known for a long time to synergize with IL-12 for Th1 cell differentiation in vitro, but its requirement for Th1 response in vivois controversial, possibly because of compensatory mechanisms present in Il18 gene-deficient mice, as elevated IL-12 production. Also, during infection, IL-18 can play an indirect role on Th1 cells, due to its effect of inducing IFN-γ in NK cells, which in turn also play a key role in Th1 differentiation. On the other hand, some studies have shown that T-cell intrinsic MyD88-mediated signaling severely impact the immune response. However, the TIR domain-containing receptor upstream of MyD88 acting on CD4+ T cells was either not investigated or not identified and, therefore, this topic remains speculative and needs further clarification. By excluding other cell types, as NK cells and the IL-1R receptor-signaling pathway in this process, our work delimitates a mechanistic framework and brings a conceptual advance to the field. To the best of our knowledge, our study is the first to formally and unequivocally demonstrate the crucial role of T-cell intrinsic IL-18R/MyD88 pathway for sustaining the Th1 response in a model of in vivoinfection, showing that IL-18R is a crucial MyD88-dependent receptor intrinsic to T cells necessary for Th1 expansion in vivo. Therefore, our manuscript answers a controversial open question of broad interest and, in our opinion, is suitable for publication in eLife. We have now included Figure 4, showing the expression of IL-18R and IL-1R on CD4+ T cells of the spleen of infected mice, by flow cytometry, as requested by the reviewer #3. As mentioned above (in answer to reviewer #1), there is no T. cruzi Y strain-specific immunodominant I-Ab-restricted peptide described in the literature. Therefore, it was not possible do perform tetramer-Ag staining. To circumvent this, we stained spleen cells with anti-CD4, anti-CD44, anti-CD62L and anti-T-bet (in addition to anti-IL18R and anti-IL-1R mAbs), which allow us to distinguish effector Th1 and memory CD4+ T cells. Our results show that while IL-18R is expressed by the majority of CD44hiCD62L+ (TCM) and CD44hiCD62L- CD4+ (Teff and TEM) T cells, mainly among T-bet+ cells, IL-1R is expressed marginally only by CD44hiCD62L+CD4+ T cells (TCM). Importantly, no increase on the expression of IL-1R could be detected on any subpopulation of CD4+ T cells from the spleen of infected mice compared to non-infected controls. Therefore, our new added data further support our previous conclusions on the major role of IL-18R on the Th1 response to infection. The only significant difference found between WT and IL-1R-/- T cells from WT:IL-1R-/-mixed BM chimeras, shown in Figure 4 (now Figure 6), concerned the percentages of CD44hiCD4+ T cells in the infected spleen. Therefore, we did not exclude a minor role for IL-1R and this was mentioned in our Discussion section. However, our data clearly excluded a role for IL-1R in the Th1 response. The new results now included in the revised manuscript on Figure 4, also show that IL-1R can only be detected on CD4+ T cells with central memory (TCM) CD44hiCD62L+ phenotype, both in non-infected and infected mice, while the expression of IL-18R increases in both effector and memory CD4+ T cells, following infection. These results add to the data presented in the first version of the manuscript, favouring a scenario where IL18R, but not IL-1R, plays a major role in the MyD88-mediated signaling, which leads to a robust Th1 response against infection. We think there is some misunderstanding here: we found no statistical difference for BrdU incorporation between WT and IL-1R-/-CD4+ T cells from WT: IL-1R-/- mixed BM chimeras. Significant difference between WT and IL-1R-/-CD4+ T cells was found only regarding the percentage of CD44hi cells, as answered in the previous question. Concerning the possibility “that additional signals may be absent when half of the non-T cells also lack expression of MyD88 or IL-18R”, we believe that the results obtained with the non-irradiated Rag2-/- reconstituted model showed on new Figure 2 (former Figure 1—figure supplement 1) discard this hypothesis, since in this case the vast majority, if not the totality, of APCs is WT concerning Myd88 and Il18r genes. The results on IFN-γ production obtained in experiments illustrated on Figure 3C (now Figure 5C) can be explained as follows: please note that, in the case of WT:WT chimera, both CD45.1+ and CD45.2+ T cells are able to produce IFN-γ and the sum of the frequencies of both IFN-γ -producing WT populations (≈ 6.3%) is equivalent to the total percentage of IFN-γ+ cells resulting from the sum of WT CD45.1+IFN-γ+ cells plus MyD88-/- CD45.2+IFN- γ+ in WT:MyD88-/- chimeras (≈7.4%). The same is true for the sum of total IFN-γ-producing cell frequency in WT:IL18R-/- (≈ 6.8%) or WT:IL1R-/- (≈ 6.0%) mixed chimeras. The same applies for absolute cell numbers (Figure 5D). This indicates that there might be a control of the total number of CD4+ IFN-γ-producing cells in infected mice. Therefore, in the case of WT:WT and WT:IL1R-/- mixed chimeras, the total number of CD4+IFN-γ+cells is equally distributed between the two populations, while in WT:MyD88-/- and WT:IL18R-/- mixed BM chimeras, the maximum number of IFN-γ-producing cells is attained mainly within the CD45.1+ WT population, since the KO CD4+ T cells do not expand in these chimeras. Absolute numbers of cells in these experiments are now shown in Figure 5D, further supporting our conclusion. Our present work demonstrates that IL-18R does give a crucial contribution to the MyD88-dependent responses intrinsic to CD4 T cells, which are necessary for a robust Th1 response. We did not claim, at any time, that the lack of IL-18R signaling accounts for the lack of all the MyD88-dependent responses in MyD88-/- mice, which include signaling by different receptors as TLRs and other IL-1R family members, in many different cell types besides T cells, such as monocytes, DCs, B cells, cardiomyocytes and others. However, the major focus of this work was exactly to study the role of IL-18R/MyD88 signaling intrinsic to T cells, during infection. Interestingly, we have also shown here, for the first time, that IL18R-/- mice are also very susceptible to infection with T. cruzi and can be rescued from death by receiving the adaptive transference of WT CD4+ T cells. This is in accordance with the results obtained in mixed BM chimeras on the importance of IL-18R signaling in Th1 cells and on the protective role of this cell subset against infection. We have discussed this issue in the Discussion section. We agree this is an important point. The role of CD4+ T cells in mediating parasite control is a fundamental question, and we have tested this point in the experiments illustrated on Figure 6 of the first version of the manuscript (now Figure 8). However, we believe there is some misunderstanding here, since two statements in the above comment by the reviewer do not apply. Firstly, results shown in Figure 5A undoubtedly demonstrate that: at day 9 pi, when the peak of parasites in the blood is attained, no statistical difference in parasitemia levels was found between Il18r1-/- and MyD88-/- mice, as stated in subsection “Il18r1-/- mice are highly susceptible to infection with T. cruzi “, while both strains of KO mice display significant higher parasitemia than WT mice (subsection “Lack of T cell-intrinsic IL-18R or MyD88 signaling leads to lower frequencies and numbers of Th1 cells but does not affect CD8+CTLs.”). This means that Il18r1-/- and MyD88-/- are equally susceptible in terms of parasitemia, while WT mice are more resistant. Second, parasite load in the myocardium is also significantly higher in Il18r1-/- when compared to WT mice, as shown in Figure 5C (now Figure 7C). Therefore, it is wrong to affirm that: “Parasite clearance seem to be largely unaffected in the absence of IL-18R signaling”, (both in the blood and in the myocardium), as stated by the reviewer. However, it is true that parasites are cleared from the blood of Il18r1-/- and MyD88-/- mice with essentially the same kinetics observed in WT mice. Also, MyD88-/- mice displayed higher levels of parasite in the tissue than Il18r1-/- mice. Since: (i) we have found the same ratios and absolute numbers of Th1 cells in the spleen of Il18r1-/- and MyD88-/- mice (Figure 5, Figure 6 and Figure 6—figure supplement 2) and (ii) we have previously shown that CD8-mediated specific cytotoxicity is totally preserved in MyD88-/- mice (Oliveira et al., 2010), we have raised the hypothesis on the putative importance of innate signaling through TLRs in the tissue for parasite control, which could explain the higher parasite levels observed in the myocardium of MyD88-/- mice, compared to Il18r1-/- mice (subsection “Il18r1-/- mice are highly susceptible to infection with T. cruzi”). In fact, it is known that TLR4 signaling and IFN-γ synergize for the induction of microbicidal activity in macrophages. Therefore, even though equivalent levels Th1-derived IFN- γ might be present in the infected tissues of Il18r1-/- and MyD88-/- mice, most TLR signaling is defective in MyD88-/- cells. As a consequence of this fact, higher parasite loads in MyD88-/- cells would result. Thirdly, contrary to what is affirmed above by the reviewer, the pathogen is never cleared in MyD88-/- mice, which all die before day 15-18 pi, a time point when parasite load is still very high in the tissues. Therefore, it is not following parasite clearance that other MyD88-dependent mechanisms are accounting for the observed survival differences, as stated by reviewer #3, although it is possible that other MyD88-dependent mechanisms, not necessarily involved in parasite killing, may be responsible for survival. We hope these points are now clarified. Concerning the role of T cells: in order to test the role of CD4+ T cells in parasitemia control and survival, we have performed the adoptive-transference experiments shown in Figure 6 (now Figure 8): while transferred WT CD4+ T cells can rescued Il18r1-/- mice from death, this treatment is not equally efficient in MyD88-/- infected mice, which mortality is significantly delayed, but not stopped. Parasitemia, on the other hand, is brought to WT levels in both Il18r1-/- and MyD88-/- mice receiving transferred WT CD4+ T cells. We also demonstrated that the capacity of lowering parasitemia depends on IFN-γ secretion by CD4+ T cells (Figure 6—figure supplement 1, now Figure 8—figure supplement 1). We interpreted these results as follows: since mortality following infection with T. cruzi is in some cases due to increased pro-inflammatory cytokine release (Holscher et al., 2000), it is possible that other MyD88-independent innate mechanisms, as the TLR4/TRIF pathway, active in MyD88-/- mice, might be responsible for this putative pro-inflammatory effect in this strain and responsible for death. Alternatively, but not mutually exclusive, tissue-tolerance mechanisms, possibly involving MyD88-dependent feedback control responses, might protect the host from immune- or pathogen-inflicted damage and would be impaired in MyD88-/- mice (Discussion section). Therefore, we believe the results shown in Figure 6 (now Figure 8) answer the question of reviewer #3 about the role of T cells in parasite control, although further work is necessary to fully uncover the reason for the failure of transferred WT CD4+ T cells to completely rescue MyD88-/- mice from death. However, this last point would require further extensive investigation and goes beyond the scope of the present manuscript. This work was supported by Fundação Carlos Chagas Filho de Amparo à Pesquisa do Estado do Rio de Janeiro (FAPERJ), Conselho Nacional de Pesquisas (CNPq) and by The National Institute of Science and Technology for Vaccines (INCTV), Conselho Nacional de Desenvolvimento Cientıfico e Tecnologico - CNPq (573547/2008-4). AG and FBC received PhD fellowships from CNPq. AG and FBC received post-doc fellowship from CSF program, CNPq. JFG and CDB received MSc fellowships from FAPERJ and CNPq, respectively. AN, ACO and MB received PQ fellowship from CNPq and AN and MB received CNE fellowship from FAPERJ. Animal experimentation: Experiments were conducted in strict accordance with guidelines of the Animal Care and Use Committee of the Federal University of Rio de Janeiro (Comitê de Ética do Centro de Ciências da Saúde CEUA-CCS/UFRJ). Procedures and animal protocols were approved by CEUA-CCS/UFRJ license n.: IMPPG022. Every effort was made to minimize suffering. © 2017, Oliveira et al.